In a seeming contradiction of its substance as an object, this unusual jar carries inscriptions from a Buddhist text on nothingness. The potter, a Buddhist who lives in the mountains of Kwangju, believes that dedication and painstaking effort are an essential part of the creative process. His work is praised for its individuality and for its imaginative embrace of antiquity, particularly the austere but beautiful aesthetic of the uniquely Korean 'punch'ong' (literally 'powder green') ceramics of the fifteenth and sixteenth centuries. 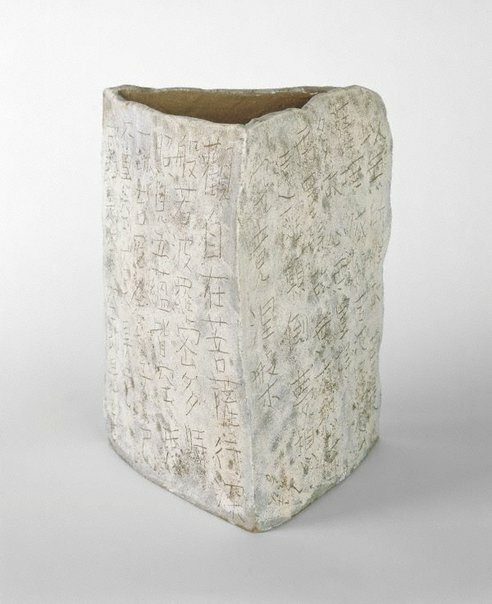 In this engaging object the artist has employed the 'sgraffito' technique in which the vessel, made in this case by the coiling method, is then beaten and its surface scoured in an instant 'maturing' process before being covered with a white slip. The characters have then been scratched through the thin slip. This rich combination of contemporary individuality with a spirit of antiquity expresses the ideals of purity, honesty and humble sparseness so admired by the connoisseurs and tea masters of modern Japan. Art Gallery Handbook, 1999. pg. 267. Bruce James, Art Gallery of New South Wales handbook , 'Asian Collection: East Asia', pg. 246-287, Sydney, 1999, 267 (colour illus.). Jackie Menzies, AGNSW Collections , 'Asian Art - India, South-East Asia, China, Tibet, Korea, Japan', pg. 173-228, Sydney, 1994, 211 (colour illus.). The Asian Collections Art Gallery of New South Wales , Sydney, 2003, 187 (colour illus.). Art Gallery of New South Wales: highlights from the collection , Sydney, 2008, 181 (colour illus. ).